The Founder of the Marian Fathers, Blessed Stanislaus Papczynski (1631-1701), had a deep devotion for the Holy Souls in Purgatory. My hope is that after reading about this personal devotion of Blessed Stanislaus and the example he gave to us, you, too, might develop an even more ardent devotion for our brothers and sisters who are suffering and need our help to get to heaven. First, this devotion was a central part of his life and thus is an integral part of the life of each and every Marian priest and brother. Father Stanislaus was responding to the times in which he lived. Poland was constantly at war with the Muscovy, Cossacks, Turks, Tartars, and Sweden. He witnessed the carnage and saw many soldiers and innocent civilians die without receiving the Sacraments. Realizing that most of them were unprepared to meet God moved him to remember them in prayer, especially at Holy Mass. 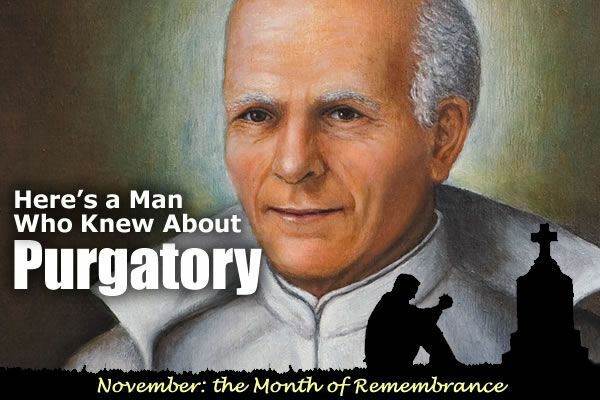 Later, his personal mystical experiences intensified his devotion for the Holy Souls in Purgatory, as he grew in understanding how much they suffer. Father Stanislaus was keenly aware that those baptized souls who died unprepared would have to suffer the torment of purgatory in order to purify them of all sin, so they could enter, holy and immaculate, into their heavenly reward. He would pray for hours, sometimes spending the entire night in the chapel, and there he would descend in spirit into purgatory and stay with them, praying for them the whole time. Since he served as a chaplain in the Polish Army led by King John III Sobieski, Fr. Stanislaus felt obliged to extend his spiritual care to the souls of the soldiers who had died in battle by praying at their gravesites. There is even testimony that the souls of the fallen soldiers would appear to him, begging for his intercession before God. After further reflection, Fr. Stanislaus began to include in his prayers those who died from the pestilence, which usually followed the wars. He would devote his Masses, prayers, mortifications, penances, and all kinds of works of mercy to the Holy Souls, and he always encouraged others to do the same, especially the members of his Congregation. One day, after saying Holy Mass, Fr. Stanislaus was having dinner with a family he was serving as their spiritual director. At the table, he fell into an ecstasy. Then, after a while, he regained his senses. Despite the table in front of him being set for a sumptuous meal, he stood up and walked out the door. He then ordered the coachman to take him back to his monastery. There, his confreres were surprised to see him back so quickly and asked him what was the matter. He said to them, "Pray, brethren, for the souls who suffer in purgatory, for they suffer unbearably!" Then, he went to his room and locked himself in, staying there without food or drink for many days and ardently praying for the souls in purgatory. When Fr. Stanislaus preached or talked about the suffering that souls go through while in purgatory, he would often have tears in his eyes and tremble at the thought of their awful torments. He claimed that there were so many souls in purgatory that their number was far beyond those who are living in the world. Those who knew him testified that whenever he fell into an ecstasy, he was in purgatory taking on the suffering of the souls who were there. Father Stanislaus wrote that he would ask God to increase his sufferings on earth, so that he could help as many souls as possible. He offered all of his illnesses, pains, labors, persecutions, mortifications, and all his pious works in sacrifice for the souls. He did it all through the intercession of the Blessed Virgin Mary Immaculately Conceived, whom he called the Merciful Protectress of the Souls in Purgatory. On another occasion, Fr. Stanislaus made a pilgrimage to the Shrine of Our Lady of Studzianna, and while there, he fell gravely ill. After confession and Holy Mass, he felt he was losing his senses and asked to be taken to a monastic cell. While appearing half dead, he fell into an ecstasy — once again, experiencing the suffering of the souls in purgatory. The residents of the monastery came to his cell to see how he was doing, and he appeared dead to them. They actually began to make his funeral arrangements! After some time, Fr. Stanislaus came out of his ecstasy. He then received a blessing from his spiritual director and went straight to the church to deliver a heartfelt sermon on devotion for the Holy Souls in Purgatory. He later told his confreres that the Blessed Mother came to him and asked him to return to life so that he might continue to help the dead. The contemporaries of Fr. Stanislaus recalled how locking himself in his cell to pray became habitual for him. There, falling into ecstasy, he would descend into purgatory. At such moments, he felt intensely the suffering of the Holy Souls, and it was noted he could be heard, saying, "O Clementissime Deus, auge mihi Dolores, et ipsis poenas minue," meaning, "O God of infinite mercy, give me more suffering and diminish their punishment." They also affectionately recalled how once, though following utter poverty, Fr. Stanislaus found that he had a gold Hungarian coin. He asked one of his confreres to take it to the local parish and ask all the priests in residence to celebrate a Holy Mass for the Holy Souls. He was rewarded for this devotion by sometimes being allowed to see some of the suffering souls when they visited his cell. There was one occasion when he saw a soul in his cell who had been judged harshly for his sins, and this soul was trembling with fear of eternal damnation. Father Stanislaus, moved with pity, immediately gathered everyone in the monastery and had them pray together with him for this poor soul. It was thought to be the soul of King John III Sobieski, who had just died in Warsaw. Blessed Stanislaus, our Father Founder, was animated by love of the Holy Souls in Purgatory. He imposed this duty on his Congregation, encouraging all his confreres to offer everything they do for these poor souls. In 1692, Fr. Stanislaus wrote in his testament that whoever would perform this heroic act of love and mercy will be doubly rewarded by God and that whoever supported his "little Order" in this work would also receive this double reward. Consequently, we should all be greatly encouraged to remember these poor souls in our prayers and daily sufferings, offering them all for their benefit — especially those of our friends and family members who may be there in terrible torment. Since they can no longer gain merit for themselves, it is only our prayers and offerings that can help them receive their eternal reward. Also, never forget to pray for those souls who are forgotten and have no one to pray for them. Our Eternal Father will reward us for this tremendous act of Christian kindness. Learn more about Blessed Stanislaus Papczynski.